Dominic Ball in action for Posh. Peterborough United have sent on-loan defender Dominic Ball back to parent club Rotherham United after a disagreement over team selection. Posh manager Grant McCann confirmed what many people suspected after the player was left out of Saturday’s (February 25) squad to face Rochdale, in a pre-match press conference today (February 27). “We had a disagreement over a team I selected,” McCann admitted. 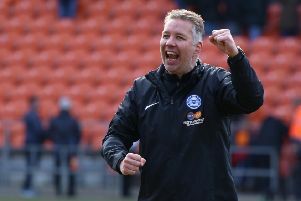 Ball played six times for Posh and scored the winning goal in a recent League One win over Shrewsbury. He was surprisingly left on the substitutes’ bench for the 4-1 home defeat by Southend last week (February 21) and was absent from the Rochdale squad altogether. Ball’s replacement Jack Baldwin is now suspended for two matches following his red card on Saturday. Michael Bostwick is expected to move back into the centre of defence in tomorrow’s (February 28) League One game at Millwall.